Eighteen allocations in a career of twenty years and ten months was the history for D7555/25205, with all the allocations being at London Midland depots. Time between last Classified repair and withdrawal: 70 months. Time between withdrawal & scrapping: 109 months. January 1966 to London Midland (Midland) Lines LMML. May 1966 to Stoke Division (D05), on loan. September 1966 to London Midland (Midland) Lines LMML. September 1966 to Nottingham Division (D16). November 1967 to Carlisle (12A). June 1968 to Preston Divison (D10). December 1971 to London Division (D01). August 1974 to Springs Branch. 25205 was the 284th Class 25 to be withdrawn, one of four retired during during May 1986. After withdrawal 25205 was stored at Bescot. A couple of cancelled sales saw 25205 remain in derelict condition at Bescot until June 17th 1995 when it was moved to MC Metals, Glasgow, being broken up there by the end of June 1995. Noted Derby Works August & September 1974 (dual brakes fitted). Noted Derby Works May - June 1980 (general repair). When new D7555 featured in advertising material promoting the Sulzer 6LDA28 engine. D7555/25205's first recorded passenger working was on the summer dated passenger working between Newcastle, Ayr & Stranraer, on July 19th 1969 working the 23.45FO Newcastle - Stranraer and the 13.50SO return. The evening Wakefield - Guide Bridge parcels was hauled by 7555 on November 30th. On May 16th 25311 & 25205 worked a coal train to Southfleet. A day excursion on June 1st was worked from Marylebone to Shrewsbury by 25205 & 25295. On the afternoon of January 5th 25205 was noted at Clacton hauling electric multiple unit 312118 from?? via Ipswich & Colchester. The Class 25 returned to Derby light engine. 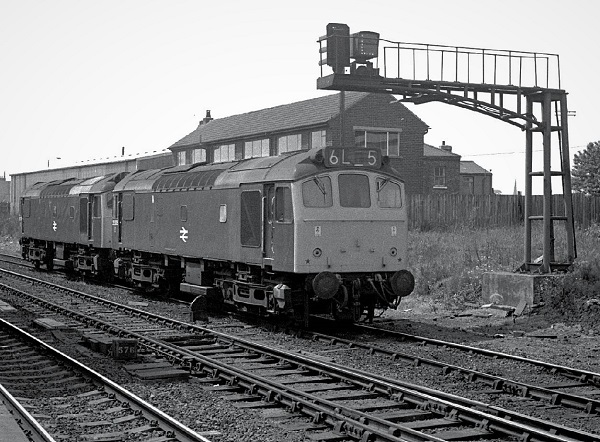 Photograph courtesy Tony Sayer A pair of Class 25s led by 25205 pass Thornaby on June 12th 1975. On August 30th 25205 & 25302 worked the Derby - Norwich - Yarmouth - Norwich - Walsall diagram. On June 5th 25205 & 25095 worked the Derby - Norwich - Yarmouth - Norwich - Walsall diagram. Further tests with Warflat wagons took place between Derby & Long Marston, 25205 was noted on July 1st and 25095 on July 27th. On July 10th 25205 & 25074 worked the 07.35 Nottingham - Llandudno Town and 13.00 return. The following week, on July 17th 25205 & 25124 worked a roundtrip Derby - Skegness. The final recorded working took place on August 28th with 25124 on the Derby - Norwich - Yarmouth - Norwich - Walsall diagram. All the recorded passenger workings during 1977 involved Skegness. On June 4th 25205 & 25029 worked a Derby - Skegness roundtrip, on June 7th the same pair worked a relief Nottingham - Skegness roundtrip. On July 16th the 12.30 Skegness - Leicester was worked forward from Nottingham by 25205 & 25135. On August 4th 1978 25205 worked the 21.20 Perth - Kensington Olympia forward from Mitre Bridge Junction. No recorded passenger workings have surfaced for 1979. 25205 was noted at Wellingborough working the 08.09 St. Pancras - Derby on December 2nd 1980, possibly having rescued the train further south? 25205 was noted on the Kensington Olympia motorail services on August 22nd & 25th 1981 with 25213. On February 9th 25205 & 25254 were stabled at Leeds Holbeck. 1982 brought a varied selection of workings, commencing on March 26th with the 07.26 Coventry - Manchester Piccadilly. Two weeks later on April 8th the 12.55 St. Pancras - Sheffield required the assistance of 25205 from Leicester when 45107 was failed with a defective horn. 25205 was noted passing through Nuneaton station with four tankers on May 25th. The Cambrian line was visited on June 5th 1982 with 25205 & 25117 working the 07.38 Shrewsbury - Aberystwyth and 10.07 Aberystwyth - Euston to Wolverhampton. On June 15th 25205 was noted heading north through Lancashire with 20069/097/127/139 in tow, the Class 20s en-route from Swindon to Glasgow for overhaul. 25205 was north of the border on July 28th working the 08.40 Carlisle - Glasgow Central. Two weeks later on August 11th 25205 worked the 11.15 Barrow - Liverpool. A passenger working came early for 25205 in 1983, on January 3rd it handled the 18.20 Glasgow Central - Manchester Victoria forward from Preston. 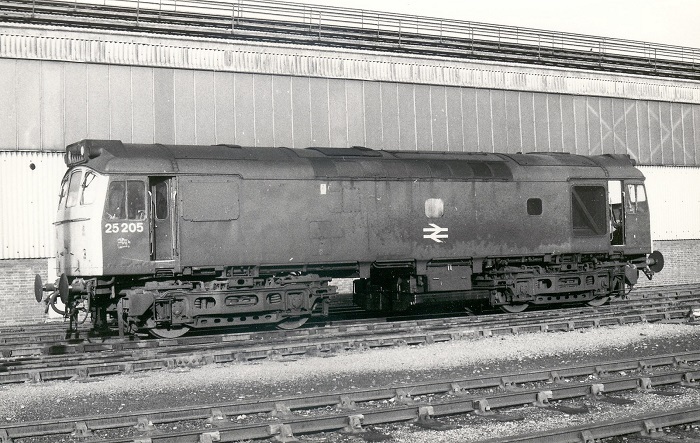 For the number crunchers there were now big blocks of scrapped/withdrawn machines including 25096 – 25106, 25128 – 25144 & 25162 – 25172, the largest continuous numerical batch of operating machines was just 25205 – 25213. On April 1st 25205 was stabled at Kingmoor, miniature snowplough equipped. On April 23rd 25205 was at Buxton depot, miniature snowplough equipped. June 11th 1983 saw 25205 & 25208 working the 10.10 Euston - Shrewsbury forward from Birmingham New Street. 25205 was noted heading south through Derby station with a train of eleven Railfreight wagons on the evening of July 15th. A run down the NE/SW mainline occurred on July 16th with 25205 handling the 09.12 Birmingham New Street - Paignton relief as far as Bristol Temple Meads where 45003 took over. For 1984 the first passenger turn for 25205 was a rescue job, on March 2nd 47117 working the 15.50 Glasgow Central - Carlisle required assistance from Dumfries. The end of March saw much continued activity of Class 25s in the North East including 25191 & 25205 on the Stranraer Speedlink and Carlisle cement workings (30th). On May 21st 25076 & 25205 worked the evening Tees - Bescot Speedlink. On June 16th 25205 & 25076 handled the 07.35 Euston - Aberystwyth from Wolverhampton, returning with 14.00 Aberystwyth - Wolverhampton. On June 23rd a freightliner was noted arriving at Bescot behind 25205, 25185 & 25xxx. A diesel multiple unit failure on July 11th saw 25205 working the 06.00 Crewe - Lincoln Central to Derby. 25205 returned to the Cambrian line on August 11th with 25218 handling the 10.10 Euston - Aberystwyth from Wolverhampton, returning with the 17.05 Aberystwyth - Shrewsbury. August 19th proved to be a busy day for 25205 & 25145, starting out with the 03.33 Crewe - Preston (via Chester). Then followed the 12.35 Preston - Barrow, the 18.21 Barrow - Liverpool and the 22.10 Glasgow Central - Euston between Preston and Crewe due to the power being off. A charter on August 27th 1984 from St. Pancras to Ravenglass was worked from/to Carnforth by 25205 & 25109. On October 4th southbound 25205 failed across the junction at Shelwick (Hereford), a following train pushed the failure to Hereford. The final workings for 1984 took place on October 24th with 25205 working the 10.10 Holyhead - Euston as far as Crewe. Later that day and now coupled to 25207, the 19.00 Manchester Piccadilly - Cardiff relief was worked forward from Crewe (3V09 parcels with passenger accommodation?). Photograph collection of webmaster 25205, date & location unknown. On a wintry February 8th 25205 & 25211 got into trouble at Scout Green on a northbound freight (oil tanks Stanlow - Bishopbriggs?) after easing for a 20mph speed restriction when 25205 shut down after suffering from low oil pressure. 81017 on a northbound freight assisted in the rear, but it too failed as the ensemble was approaching Shap Summit. 87016 & 86035 working a southbound freightliner were detached at Hardendale and assisted the northbound train to Penrith. 25205 was noted passing Crewe Bank, Shrewsbury on February 26th with a well loaded ballast train (six bogie & two short wheelbase wagons) north from Bayston Hill. On April 11th 25205 was noted at Gloucester heading west with a weedkiller train for Severn Tunnel Junction. 25205 worked the 3V20 1510 Manchester Red Star - Bristol Temple Meads on May 17th, being noted at Newport with four vans. The passenger workings in 1985 dwindled to three. On July 4th 25205 worked the 08.34 Stoke-on-Trent - Llandudno Town and 18.00 return. On August 13th 1985 the 19.30 Sheffield - St. Pancras HST required assistance from Trowell Junction to Nottingham by 25205 (also reported as 25202). The service was terminated on reaching Nottingham. 25205 was noted at Leicester Station on September 12th (no miniature snowploughs fitted). Two days later (September 14th) 25205 worked an engineering train through Crewe station. 25205 with three piece miniature snowploughs fitted was noted at Ladywell Sidings, Preston on December 22nd. The final passenger working for 25205 took place on March 24th 1986 assisting the diverted 10.20 Manchester Piccadilly - St. Pancras from Nuneaton to St. Pancras, diverted because of overhead line damage at Hanslope. 25205 with three piece miniature snowploughs was noted at Saltley on April 17th. The next day (18th) 25205 worked the Dudley to Glasgow evening Freightliner as far as Bescot Yard, here electric traction would take over. On April 25th 31468 brought the Willesden breakdown vans to Sudbury Yard in order to re-rail visitor 25205. This incident is presumed to have brought about its demise on May 12th? Finally in June 1995 the remaining hulks at Bescot, which had now been withdrawn for about nine years, were dispatched by road to Glasgow and quickly dealt with. 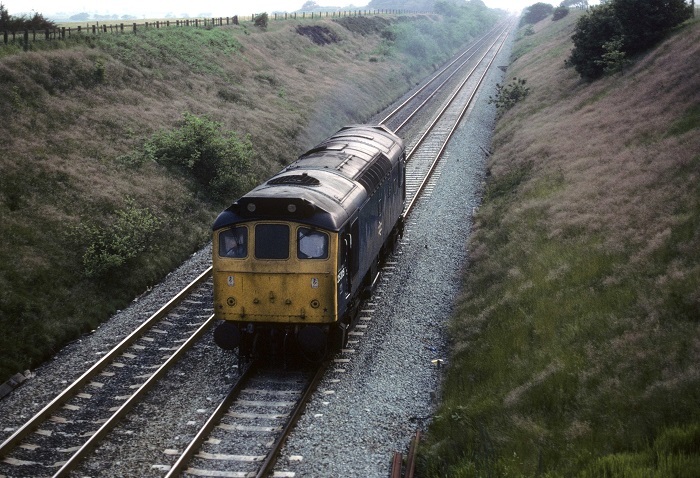 Six locos had originally been placed in Bescot’s down local sorting siding during 1985. Several had moved on, 25206 went to Doncaster Works in 1990 to become a parts source for 25912, preservationists claimed 25235, leaving 25194/205/211/259 to await their fate. However through the continuing generosity of the management of MC Metals these hulks, as well as those received previously, were broken up only after they had given up many valuable components, including complete bogies, power units and generators to various preservation groups. For these groups this would be the last such opportunity, as the Sulzer engined Type 2, Classes 24 - 27, was now extinct outside of preservation (except for 25083). Page added June 5th 2013. Last updated March 15th 2019.